In the course of all fashion trends, the leather jacket has always stood the take a look at of time and executed so with a punch. Not handiest does the leather-based jacket deliver an air of conceitedness and defiance, however, it's also an exceptionally flexible, classic jacket that can be worn to in shape any event. Whether or not you favor to component with a complete month’s wages or select a greater inexpensive leather jacket, there is actually one accessible looking ahead to you. William jacket is one of the leading online stores that provide his customers with high-quality leather jackets at very affordable rates. There are some distinct forms of leather-based jackets and picking the right one can be an overwhelming challenge. But, the leather jacket can complement nearly any outfit. Whether or not you’re looking to buy a motorbike leather jacket or simply trying to boost your iciness wardrobe, there is truly a style accessible to fit you. It's far critical to take time to cautiously pick out the right fashion and fit for you to create the first-rate, maximum flexible appearance. Permit’s take a look at the first-class leather jackets for guys below.Robert Taylor Longmire Coat inspired by famous TV series Longmire which had the key role Walt Longmire who depicted by Robert Taylor. This jacket is made up suede leather with viscose lining inside the jacket. it has stood up collar with open hem cuffs. Seude leather provides you with the exceptional durability and quality that improves with the age. It has full sleeves with a standing collar that makes it more unique than any other leather jacket.Jorge Maze Runner The Death Cure Leather Coat is inspired by Hollywood movie Maze Runner The Death Cure which was about to endure after fleeing from the maze. Jorge has played the main role as Giancarlo Esposito. He used to wear this beautiful leather jacket. It has a high stand collar with long sleeves that make it more unique and stylish among other leather jackets. Jorge Maze Runner The Death Cure Leather Coat will never let you down.Star-Lord Vol 2 Coat is one of the favorite and most sold out coat. Star-Lord Guardians Of The Galaxy Vol 2 Chris Pratt Leather Trench Coat is inspired by the smash hit Hollywood movie Guardians Of The Galaxy Vol 2 where Chris Pratt used to wear this beautiful jacket. Its stunning and eye-catching color makes it unique. This jacket is made up of PU leather with viscose lining inside. It has half zip closure with open hen cuffs. 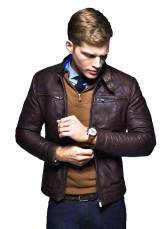 Just go William Jacket.com and select your favorite leather coats.